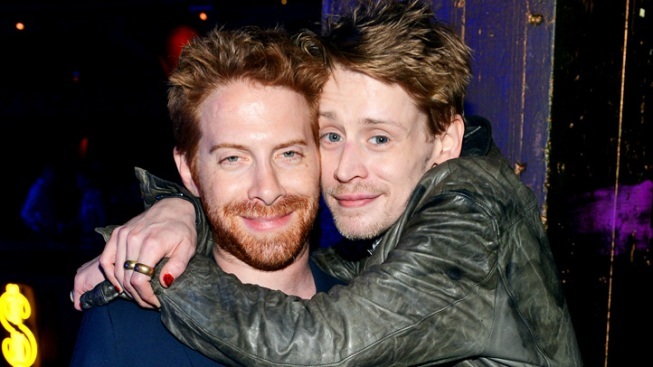 Actors Seth Green and Macaulay Culkin attend the 2012 Adult Swim Upfront Party at Roseland Ballroom on May 16, 2012 in New York City. Culkin was recently spotted out in Los Angeles. After being the center of "impossibly and ridiculously fictious" drug addiction claims, actor Macaulay Culkin was spotted in Los Angeles looking, well, better than before. A not-as-frail Culkin--who was strutting a plaid shirt, jeans, blazer and most importantly, some meat on his bones--was seen clutching his stomach in what looks to be a cough attack while visiting celeb hot spot Chateau Marmont on Friday. The actor also reportedly attended Natalie Portman's super-secretive wedding on Saturday night, though his rep told E! News, "I have no comments on his activities over the weekend or otherwise. Thank you." Culkin made numerous headlines last week after tabloids claimed he had a serious addiction to heroin and prescription drug and--wait for it--only had six months to live. His rep was quick to blast the rumors, telling E! News that "the report in the National Enquirer that Macaulay Culkin is addicted to Heroin and assorted hallucinogenics is not only categorically without merit, but it is also impossibly and ridiculously fictitious. We beseech the responsible media to consider the source and its reputation and to please not perpetuate this destructive and insulting story by pursuing it any further." How does Macaulay look to you? Let us know in the comments! Catch some of today's hottest pictures!